About three hours later, Twitter did come through: an organization called Lambrusco Days tweeted me an instructional video -- from a Japanese site! Longtime blog readers know that I speak Japanese, so this was not a hurdle. However, the method employed by the video maker was so dangerous and so ineffective that I'm not going to link to it, as it involved using a knife and pulling toward oneself with the sharp edge. I'm glad I was at home and not in a restaurant. I got out my Sharper Image toolbox, which had been a wedding gift for the unhandy. I don't think I'd ever used the needle nose pliers before, but that's because I never tried to open a bottle of Cleto Chiarli Vigneto Enrico Cialdini Lambrusco Grasparossa di Castelvetro Secco before. I pulled off the metal clasp with the needle nose pliers, and then the cork easily came out, and voila: chilled, dry red wine with a light fizz, the perfect wine for that rare sweltering 80 degree (27 Celsius) evening in San Francisco. We were having some salumi, which is what inspired me to try to open the Lambrusco, but it also went well with grilled salmon. The experience got me to thinking about Overwhelmed drinkers and all those $9 supermarket bottles they face. How many have some sort of stopper that needs removing? Synthetic corks have come a long way, but they're still an obstacle until you've opened 20 or so of them. Most of the time I don't feel sorry for the Overwhelmed. There are hundreds of wine introductory books out there, and small wine shop owners who are happy to answer questions. If the Overwhelmed didn't insist on buying their wine at supermarkets -- the worst place possible -- maybe they wouldn't be Overwhelmed. But for an evening, I knew just how they felt, when I had a bottle of wine with a 29-syllable name and no instruction manual. Did anyone suggest flipping it like a Kolsch ale bottle? That's probably the first thing I would have tried. That's what it looks like. Nobody suggested anything! I was left to my own devices, which fortunately including the needle nose plier. I don't know what a Kolsch ale bottle looks like, but the Lambrusco's metal clasp didn't flip open. I tried twisting it, yanking it. It took me a long time to accept that there wasn't some easy way to open it that I just didn't understand. I did see this wine today, btw, at Bottle Barn in Santa Rosa. We are Chiarli's US representatives. The correct way to open bottles with this type of closure is with a traditional butter knife. You insert the knife vertically between the side of the metal clamp and the side of the cork. Then you pry the metal clamp at the bottom away from the neck of the bottle. It takes minimal effort to do this. You can also use the knife or corkscrew portion of a waiter's corkscrew, but if the corkscrew is not good quality, you risk damaging the corkscrew. The butter knife is the "right tool for the job" - as Mister Magic would say. Thank you Dave. I can see how a butter knife would be effective, but needle nose pliers seem more effective. But butter knives are more widely available in restaurants. Some of my friends responded to this post and said they also use pliers. Wisdom of crowds. I always use my trusty knife on my wine key. And Viola, minimal effort. Happy you were able to get into it. It's 10pm in Spain, and I was just about to open a bottle of cava - when I found this type of cork. Never seen it before in my life! Perhaps a bit overkill, but a bread knife worked for me! Thanks everyone, from a peaceful evening in Nerja. These comments saved a great bottle late at night in Spain. Very perplexing duty free cava. Side handles of corkscrew worked great! The internet is a wonderful thing. I am now very happy with open cava and a new skill set. Thanks! You are all beautiful, amazing human beings. Had a bit of a panic initially but you all came to the rescue. Thanks! I was about to take the pre-Internet option of running out into the streets of (Seville) and accosting strangers with my muddled Spanish while waving a bottle in their faces - a course of action not guaranteed to end well. Instead I'm sipping an admittedly average but muy cheap cava while my pimientos de Padrón are toasting on the stove. Thanks, from the heart, and also to Google for recognising the search terms 'strane cava cork'. So grateful for this post! Five very relieved Cava drinkers here in Málaga. Thank you all! Wanted to let you know we found this post still very helpful in 2017 for a bottle of Cleto Chiarli Vecchia Modena. 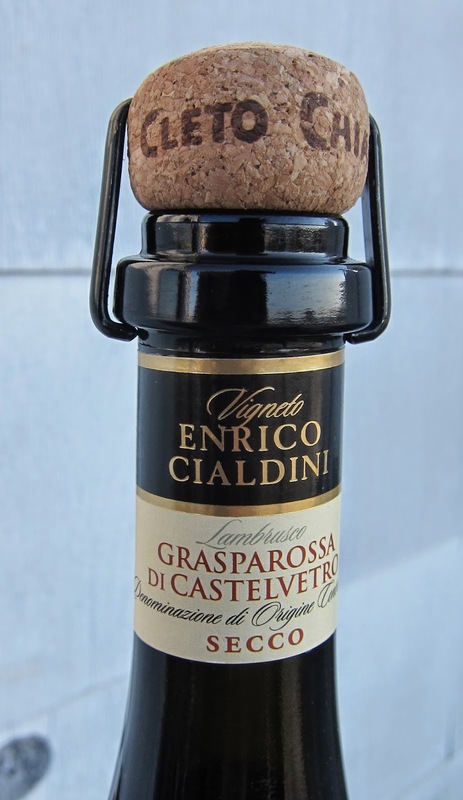 We were quite perplexed as we recently had the Pruno Nero from Chiarli with a "typical" Champagne cork. Thank you!! Thanks for the thanks: it always feels good to write something helpful. Thank you, 2018 and your post is still useful! I used the side of a cork screw and prised it off with ease on a bottle of Cava in Madrid! Gracias !! The real question is: Why was this closure invented?